We guarantee you won't be able to deal cheaper - anywhere. By buying professional market Good Delivery gold you save at least 7% of the cost of coins or small bars. And when you sell you'll get the best price too, because Good Delivery gold is the only gold you can easily sell on the world's professional markets, where selling prices are highest. But unlike the professional markets on BullionVault there is no minimum trade size, so you don't have to spend $500,000 to get the best price. Also you're not restricted to dealing in US Dollars. You can buy and sell directly in Euros, British Pounds and Japanese Yen too, which means if you're European, British or Japanese you save a further 3% in currency conversion costs. Estimate your commission and storage fees using our cost calculator. 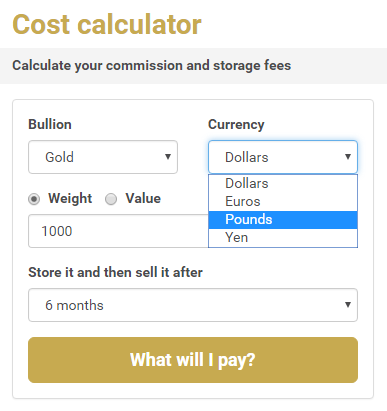 Using live prices, this calculator lets you see how much gold or silver you can buy on BullionVault for the sum of money you want to invest, plus how much you will pay in fees to buy, store and then sell your metal. You can also make savings by cutting out the middleman. You do this by acting like a market-maker, which means you can quote your own buying or selling prices to other buyers and sellers on BullionVault's exchange. This saves you money whenever you deal, because you won't pay the spread that a market-maker usually takes from you. You save on storage too. Your bullion is stored in a fully insured and accredited professional bullion vault, which means storage charges are much, much lower than anything comparable. You pay just 0.12% per annum. ETFs cost more than three times as much; they usually charge 0.4% per annum and they don't include insurance. You will own professionally approved, Good Delivery bullion gold, in the international location of your choice. It is fully allocated. BullionVault does not deal unallocated gold. Your accredited Vault Operators are Loomis International, Malca-Amit and Brink's. They operate in most of the world's major financial centres. We recommend you check their excellent credentials yourself. There are links in our due diligence section below. After they are manufactured by accredited refiners the gold bars traded on professional markets around the world stay their entire lives in formally accredited vaults. They never pass through private hands, where they could be corrupted. Because of this they are always trusted by dealers, such that professional buyers only accept bars delivered direct from these specialized vaults. All professional buyers, which will include you, benefit from a permanent guarantee of integrity of gold bought and sold within the Good Delivery system. You choose your storage location(s) from Zurich, London, New York, Singapore and Toronto, so that at no extra cost you can distribute your geographic risk, often outside the country where you live. That's worth thinking about. By owning gold overseas you can avoid jurisdictional exposure and potentially make significant profits should exchange controls be re-introduced - something more and more people are starting to fear. OK, but how do you know your gold is really where we say it is? Nobody matches BullionVault's transparency with respect to customer property. Every day we post both a private 'nicknamed' register of all BullionVault's gold owners, and the reconciling bar list from our vault operators. We also post the register of Client Money and the bank statement from our bankers. Only you know your nickname. This means you can see your gold and any cash holdings daily and anonymously proven by public reconciliation to bar lists and bank statements provided by independent third parties. You can then click through to our auditors' report on the total accuracy of the daily reconciliation. It's published on their website to assure you of its independence from us. There you'll also see the professional assay report from LBMA approved Alex Stewart International, one of the world's largest bullion inspection business, who annually re-verify the quantity and quality of gold bars held for BullionVault Clients in the formally accredited vaults. So that's five cross-checks by five separate and professional organisations each of which is owned and operated independently of the others. No other bullion business in the world comes close to this degree of independent checking and daily, public disclosure. Because we use professional vault operators and implement these precautions and controls insurance is much, much cheaper for gold stored in BullionVault. Insurance actuaries know how much safer it is there than anywhere else. So your insurance is included at our expense, and we publish the insurer's cover note on-line for your inspection; a sixth independent control. Of course your safety involves a broader range of issues than just physical bullion security. First there's internet security. We've made your BullionVault account safe even from someone discovering your login and password. How do we do that? There are two techniques. Firstly your account is burglar-alarmed, which means whenever anyone logs in we send your cellphone an SMS message. Secondly we only allow money leaving your account to go straight back to you - that's usually to the original funding bank account, but sometimes to your new bank account, provided your new banker has endorsed your identity. We've also protected you completely from our own financial failure, or the failure of our vault operators. Both BullionVault and the vault operators it has selected are your custodians employed to look after your gold. Unlike your money deposited at a bank (which under banking law becomes your asset, and the bank's property) your BullionVault gold remains your property throughout. It never goes on our balance sheet. Your gold stays in the vault and reverts to you in full in the event of a financial failure. That's what custody means. You are not depositing your gold, or transferring it to us, you are paying a custodian to safekeep it for you, which is fundamentally different in law from depositing in a bank, and it is immeasurably safer for you. In any event BullionVault is a much more cautious organization than your bank. We never lend your gold (a bank usually would) and we keep at call sufficient free capital to pay all our operational expenses for at least 5 years - which is 20 times more operational cash cover than is required by your bank's regulator. We've even taken precautions against our annihilation which ensure that both our auditors and vault operators get access to full ownership records in the event of our destruction. Taken together these precautions put you in a far more secure position (and at much less cost) than were you to take gold home for storage. That's why in 2009 BullionVault won Britain's most prestigious business award - The Queen's Award for Enterprise - both for making the low-cost efficiencies of the professional bullion market available to retail customers and for the transparent safety of the storage system. 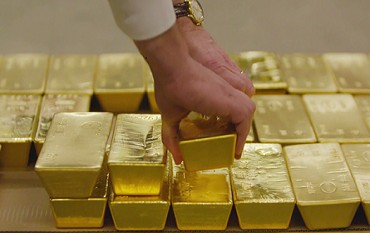 With over 70,000 users, and much more gold than most of the world's central banks, BullionVault is the largest retail distributor of professional quality bullion in the world. We've got to be the best by being straightforward, being thorough, being knowledgeable, and by making gold cheaper, safer and easier for you. When you want your money back just go online, sell your gold and withdraw your money. We wire your funds the next business day. There is no minimum period for holding BullionVault gold, so there is no penalty for changing your mind and wanting your money back. Compare popular ways to buy gold by reading our guide Ready to Buy Gold. See professional and customer references. See the reconciled register. Compare the Zurich total to the Zurich bar list. The wholesale bullion markets in which BullionVault operates are regulated through the LBMA's Global Precious Metals Code (ratified in 2017, replacing the previous Non-Investment Products Code). BullionVault and BullionVault's vault operators are full members of the LBMA and so are signatories to this Code. View the LBMA's Member Search. [#1] Approximately 98% of gold traded worldwide is unallocated. This includes retail investment products like gold accounts and gold certificate programs. Unallocated gold is so-called paper gold credited to you on a balance sheet - usually, but not always, by a bank. It exposes you to counterparty default. Conversely allocated gold is physical bullion which is your property and no-one else's liability. For your safety BullionVault only deals allocated gold.